I asked him where the Ganga Kinare was- the bank of Ganges. He said straight ahead. I asked if it was clean. He got upset. This is the first lesson that you will learn here. Mother Ganga can never be dirty. To even suggest it causes heartache for those who see her spirit. See, I have learned that the Ganges exists on two different levels- she is a river and a Goddess both. As a river, she is contaminated by human, animal and otherworldly waste- food, dead bodies, pesticides, flowers, dirt from washing clothes and vessels, and a mass of bodies fighting for space, water, and sustenance. As a Goddess, she is filled with hope, the prayers of the devoted and the pious, wisdom- she is the one refugee for humanity hoping to rid themselves of their sins, she carries the burden of their life in this world and their peace in the next world. How amazing- one river could become the source of strength for an entire country. I was so touched- thankful to be here. I came back to Chirag armed with 3 bottles of Ganges water from Rishikesh while white water rafting. It’s really something. After traveling from Nainital to Haridwar to Rishikesh for a 4 day vacation (and to do paperwork) and back I was so absolutely tired and happy and touched and completely done at the same time. So in lieu of textbook knowledge about the region or the culture or how amazing the food was or how hot it was, I will give you some totally practical street advice if you’re traveling in India. 1) If someone shows you a picture of a God or Goddess and asks for money or you encounter orange clothed sadhus on the hustle, remember and plant this truth firmly in your heart, “Spirituality is not a business.” Keep smiling, keep moving. 2) Ask the same question, whether its directions, bus timings, etc., to at least 3 different people- compare answers. It reduces your chances of getting played. 3) Never ask the rickshaw driver any questions. His answer will always be, “Get into my rickshaw, I will take you there.” Not to mention charge you five times what he charges the locals. 4) Bargaining is a game. But once you start playing, it will get dirty fast. Never let yourself get guilted or cornered into buying something. Many people end up saying, “I felt bad and had to buy it.” You never have to buy anything. You are the consumer, there is a reason it’s your money. 5) Eat the street food. No one ever died. But they did feel very sad when they left India without experiencing it. You will get diarrhea regardless of what you eat here at some point. 6) Push back. If you’re sitting on a train, standing on the bus, walking in the city, waiting in a line, buying clothes at the bazar, chances are there are people pushing you. Push back. It is your right. Claim the space that belongs to you and defend it zealously. It can be joyous and triumphant. 7) Make small talk only up until a point. Once it starts getting weird, stop. Go into headache/sleep mode. Or fake a phone call. Or leave. There is no graceful way to do it. 8) Always carry change. No stall wants your 1000 rupee note that they have to give up their entire day’s earnings for so you can get change. Pay exact and everybody’s lives will be happier. 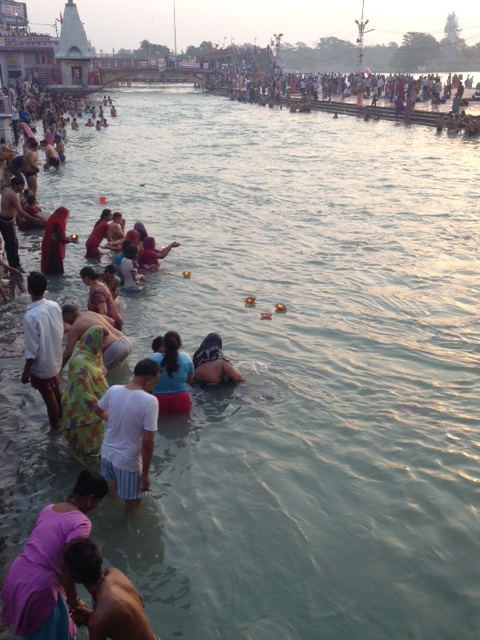 I swam in the Ganges while white water rafting in Rishikesh, and I’m still alive. Probably not the most sanitary thing I’ve ever done, but worth the story. I’m glad someone else took the time to visit there. Rishikesh isn’t one of the more traditional destinations, but it was one of the highlights of my trip! I'm a recent Bioengineering graduate from the University of Pennsylvania. I will be headed to Chennai, India over this next year to conduct public health work as a Fulbright Student Research Fellow. My interests include Eastern spirituality, medicine and contemporary approaches to healing, hiking, being part-lion/part-owl, and watching the stars at night. Peace.